There is no question that the dog inhabits a singular position in relation to humans, a position no other animal occupies. But where did this extraordinary bond originate, and what distinguishes it from the way we feel about other animals? And why is it that humans are as important to dogs as they are to us? Jon Franklin set out to find out and ended up spending a decade studying the origins and significance of the dog and its peculiar attachment to humans. As the intellectual pursuit of his subject began to take over Franklin’s life, he married a dog lover and was quickly introduced to the ancient and powerful law of nature, to wit: Love me, love my dog. Soon Franklin was sharing hearth and home with a soulful and clever poodle named Charlie. And so began an odyssey, from a 12,000-year-old grave to a conclusion so remarkable as to change our perception of ourselves. Building on evolutionary science, archaeology, behavioral science, and the firsthand experience of watching his own dog evolve from puppy to family member, Franklin posits that man and dog are more than just inseparable; they are part and parcel of the same creature. 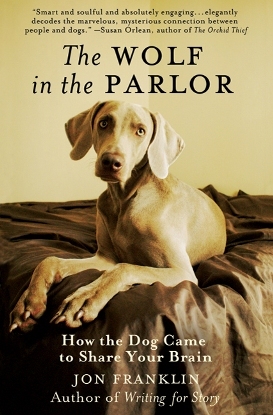 Along the way,The Wolf in the Parlor imparts a substantial yet painless education on subjects as far-ranging as psychological evolution and neurochemistry. In this groundbreaking book, master storyteller Franklin shatters the lens through which we see the world and shows us an unexpected, enthralling picture of the human/canine relationship. As always, only daily digest subscribers are eligible, and if you’re not one, you can fix that in five seconds by clicking here. When your first daily digest e-mail arrives, hit reply, type the words “enter me” in the subject and send (current subscribers can reply to today’s digest). We’ll use randomizer.org to select a winner, who will be notified by e-mail. Entries will be accepted through midnight Sunday, and please note that only residents of the US and Canada are eligible to win. Get those entries in asap for your chance to win and to gain a better understanding of our best friends. And as always, good luck!